"Any person presenting this bill at my store will be entitled to use it at its face value, FIVE DOLLARS, in part payment for a cash purchase of goods amounting to One Hundred Dollars or upward, and on smaller purchases pro rata. But one Bill will be received on a single purchase of the above amount. 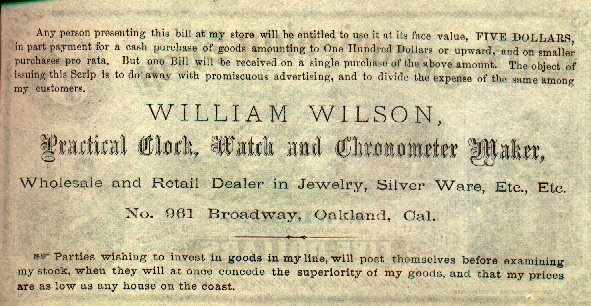 The object of issuing this Scrip is to do away with promiscuous advertising, and to divide the expense of the same among my customers. Wholesale and Retail Dealer in Jewelry, Silver Ware, Etc., Etc. No. 961 Broadway, Oakland, Cal. Parties wishing to invest in goods in my line, will post themselves before examining my stock, when they will at once concede the superiority of my goods, and that my prices are as low as any house on the coast."